Rovio has taken the wraps off a brand-new Angry Birds mobile game at the Game Developers Conference (GDC) in San Francisco today. 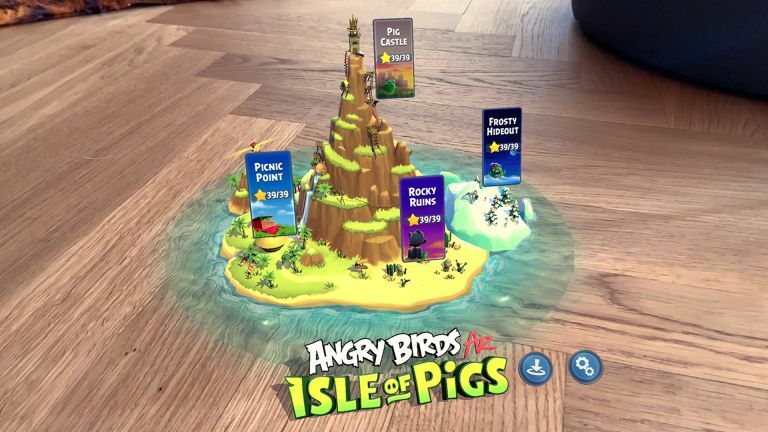 Dubbed Angry Birds AR: Isle of Pigs, the new title leverages the ARKit technology that Apple introduced in 2017 to enable iPhone and iPad owners to place the puzzles in their surroundings. Unlike the original two-dimensional puzzler that kickstarted the Angry Birds phenomenon, which saw players tap and drag on the touchscreen to aim a slingshot and fire the titular enraged fowl, the latest iOS game requires players to crouch and move around the room to find the best angle to take-out the piggies' fort. Granted, that means Angry Birds AR: Isle of Pigs likely won't be your go-to game during the morning commute on a cramped train carriage. However, when you've got a little more room to breath, the new Augmented Reality (AR) title looks like an interesting new twist on the classic Angry Birds formula. Angry Birds AR: Isle of Pigs places the slingshot in the lower-third of your iPhone or iPad screen. Like earlier titles, you'll still need to pull back on the touchscreen to build-up your shot, but standing still won't cut it. In fact, Rovio says they have deliberately engineered the puzzles so that those who check 360-degrees around the three-dimensional level and crouch down will find the best vantage point and hidden items. The colourful Angry Bird characters will react to your movements, too. For example, if you push your iPhone until it's almost pressing against the nose of one of the piggies in the course, they'll show you exactly how they feel about their personal space being invaded. You won't need a vast, sparse room to play the new title, either. The AR technology built into iOS can be used to overlay the all-new Angry Birds levels on a relatively small surface, like a tabletop, or carpet. So you don't need to worry about clearing out the spare bedroom, like you have to do for most VR gaming experiences. Given that this kind of interactive, augmented reality gameplay isn't possible on the latest round of home and portable consoles, it really highlights just how far mobile gaming has come along. Given that Rovio remains shtum about plans to launch the title on Android, the new Angry Birds also highlights how far Apple is ahead of the pack in this AR gaming space. Angry Birds AR: Isle of Pigs, which is available to pre-order today on the App Store ahead of its worldwide launch in "late spring", will start with 40 levels of gameplay, although developer Resolution Games says there is scope to add more in future. Eagle-eyed fans of the series will notice that the character models have been subtly tweaked to match those used in the Angry Birds Movie, which still holds the record as the second highest-grossing video game film of all-time. Rovio Entertainment CEO Kati Levoranta said: "We’re delighted to bring the beloved physics-based gameplay of Angry Birds to life through augmented reality. It’s an especially timely moment to bring our avian friends to mobile AR for the first time, as this year marks the tenth anniversary since the release of the first Angry Birds game." Apple introduced ARKit at the World Wide Developers Conference (WWDC) back in June 2017. The technology includes the framework for iOS developers to place objects in the physical spare around you and, more importantly, keep them tethered to the spot even as you move around your surroundings. ARKit also handles reflections – so you'll see the family photos on your wall reflected in the blocks on ice in some of the chillier levels of the new Angry Birds title. Angry Birds AR: Isle of Pigs requires iPhone 6s and newer, all iPad Pro models, as well as fifth- and sixth-generation iPad models. Apple recently confirmed plans to hold its next WWDC on June 3 - 7, 2019, we could see further improvements to ARKit that will enhance titles like Angry Birds AR: Isle of Pigs in future updates. New versions of iOS, macOS, and watchOS are also rumoured.